Extravagant rockers Kiss are set to stream the closing date of their North American Hottest Show On Earth tour via cult Facebook game Nightclub City this Saturday (September 25). The band, famed for their onstage makeup and '70s hits like Rock And Roll All Night and Detroit Rock City, will also be streaming the California show live on Ustream. Players of Nightclub City, a popular Facebook application game that allows players to open and customise their own nightclub, will be able to log on and watch the concert in-game. 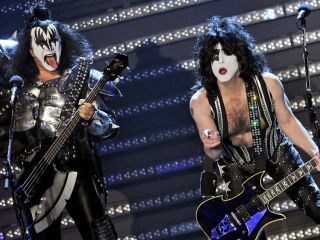 Players will also receive Kiss-themed 'bonuses' allowing them to customise the game. For more info, check-out Kiss' website. Facebook users can find out more about Nightclub City here.